The international heartthrob artist and the X-Factor Australia Chris Cayzer will conquer your Friday nights in Tambayan Sa Kanto's newest offering, "Togs Sa Kanto!" After the successful series of Acoustic Nights every Fridays and Saturdays which featured different acoustic artists, Tambayan Sa Kanto now launch "Togs Sa Kanto," a Filipino colloquial term which means "Tugtugan Sa Kanto." And as its opening Salvo this Friday, June 7, 2013, Chris will share his music! As its opening treat, Chris will showcase his new line of music, his new renditions of the different hit songs, and his versions of the classic music. Definitely, he will let the audience hear new sets of songs they never heard before from his cool voice! The gig starts at 9pm and ends at 2am. 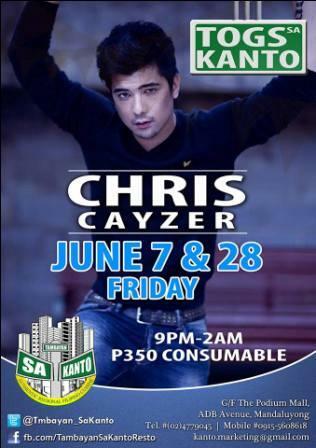 With only Php350 consumable, we can enjoy Chris music at the same time enjoy the goodness of Filipino cuisines!